If I ever meet Gayla Trail, I might just have to hug her to show my gratitude. I found myself in a hospital waiting room with my father pacing…anxiously…and ready to crawl the walls. We found little ways of getting each another through those 5 hours, one of which was thumbing through this wonderful book together to pass the time and think happy thoughts. If you thought you were a plant geek prior to reading this, brace yourself. You’ll be dreaming of warm summer days, tomato sandwiches, and ways to fit in a few extra pots for herbs you may never have even heard of yet (Shiso? Count me in!). Seriously, Gayla Trail has a very approachable way of introducing her readers to container and small-space gardening. Mark my words, she really knows her stuff. From inventive ways of starting your seeds to growing your favorite flowers, herbs, vegetables, and fruit (ranging from pest control to companion planting), you’ll be so ready to go when your last possible chance of frost passes. Aside from legitimately solid information and advice, Grow Great Grub offers something very unique and not found in many gardening manuals: inspiration. The pictures are absolutely lovely to say the least, the visual design of the book is pleasing, and she has a way of really helping you get excited about your own personal organic garden revolution. I can’t seem to stop flipping through to read the recipes (yes, there are recipes too), gazing longingly at the beautiful photos, and continuing to ponder what else I can add to my beds or pots this year. This book even got my husband, the non-gardener, to find certified potatoes to try out some “trash can spuds” this year. 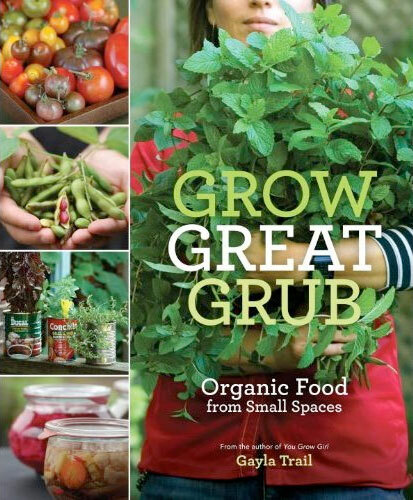 I say, without hesitation, Grow Great Grub is the best purchase I’ve made in a long time. If you are a garden enthusiast (large or small), I highly recommend this book. You can view a few page spreads here. Which one is your fav? I only have this one and always looking for recommendations. I’ll try to remember to bring them and a couple others in this week. I have an entire collection of awesome gardening books. I’m addicted.